You can create printable tests and worksheets from these Grade 6 Biomes questions! Select one or more questions using the checkboxes above each question. Then click the add selected questions to a test button before moving to another page. This type of biome has trees that produce needles and cones, such as pine and fir trees. The temperature can be very cold. Mostly found in northern Canada, it is also called by its Russian name, taiga. This biome can be very hot or cold and has very little rain. Which statement is true about biomes? Desert is always located next to savanna. 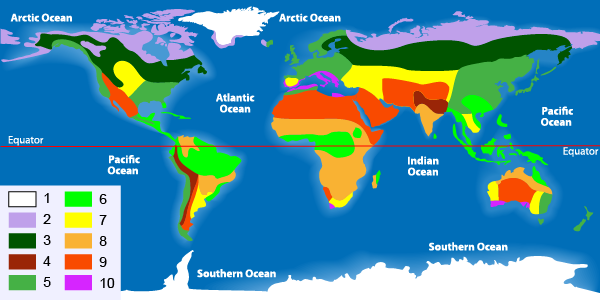 Steppe and tropical rainforest are both located along the equator. Taiga and tundra are both located in the northern hemisphere. Mediterranean vegetation covers the largest area. Which sphere of Earth's system includes trees, grass, and squirrels? This biome is extremely cold, has no trees, its plants have shallow roots, and its animals are furry. This biome has changing seasons, many trees, deer, and raccoons. The leaves fall off the branches of trees each year. Which climate most likely has the greatest variety of animals living in it? Which biome has trees that stay green all year round and cold temperatures? What is the biome that includes lakes, rivers, streams, and creeks? 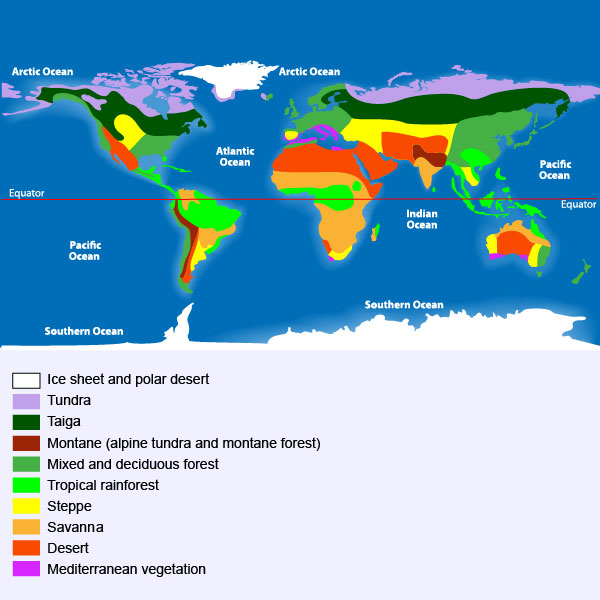 Which biome is extremely cold, has no trees, the fur of most of the animals is white, and the land's top layer is frozen? The tundra biome is best represented by which number on the map?